Updated to include a comment from the Marathon Motel indicating a reported bomb threat there was the result of a misunderstanding. 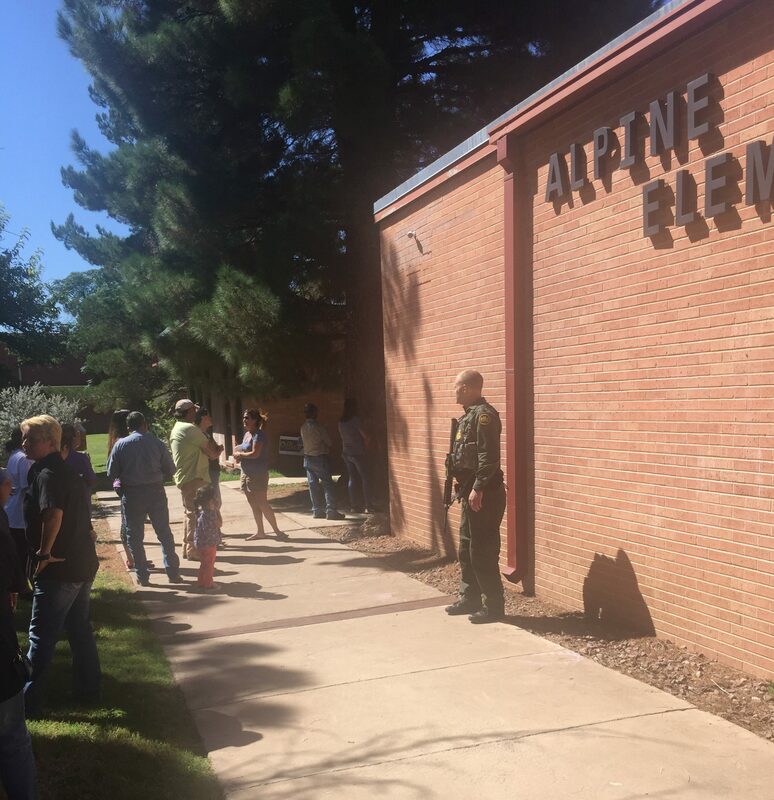 A seemingly average Thursday morning in small-town Alpine, TX turned traumatic after a 14-year-old female freshman student shot and injured another female student before turning the gun on herself. 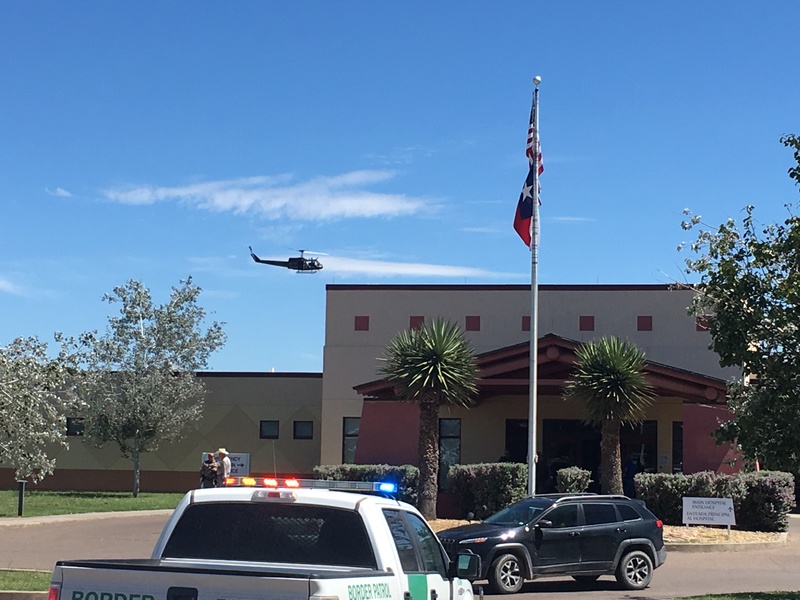 Brewster County authorities said the shooter was found dead from an apparent self-inflicted gunshot wound, and the victim suffered non-life-threatening injuries. The identities of the shooter and the victim have not been released. In a press conference Thursday afternoon, Brewster County Sheriff Ronny Dodson expressed shock at the incident that took place sometime after 9 AM, saying his department had never had to respond to an “active shooter” situation of this type before, especially at a local school. “It’s not supposed to happen here,” he said. Authorities said the shooting happened inside the high school near the band hall. Band Director Chuck Wilson – who said the victim was one of his students – echoed Dodson’s sentiment about the unusual nature of the shooting in a town where violent crime is rare. Alpine Police Chief Russell Scown said first responders didn’t initially realize the dead 14-year-old was the shooter. “We thought we still had an active shooter out there,” he said. 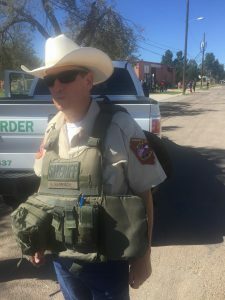 While authorities praised the quick response of multiple law enforcement agencies – Alpine Police, Brewster County deputies, Texas Game Wardens, Border Patrol agents and Texas state troopers among them – Dodson also told reporters the shooting “could’ve been a lot worse”, though he didn’t elaborate. All Alpine Independent School Districts were placed on lockdown in the wake of the shooting, and the high school was evacuated to nearby churches. Dodson and Scown indicated that they may release more details related to a possible motive in the shooting in the coming days, after they interview a handful of witnesses they believe may have seen the shooting unfold. At the same time, both law enforcement officials described with frustration how bomb threats scattered across Alpine throughout the day hindered authorities’ ability to investigate the shooting. 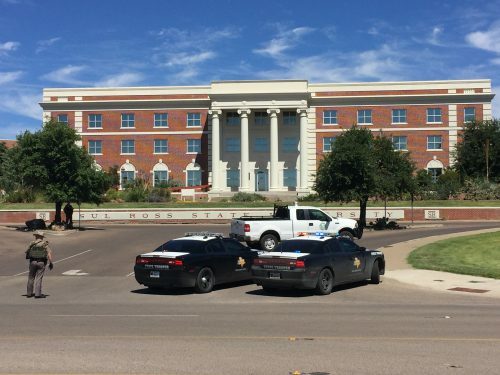 Shortly after the shooting, Dodson said the sheriff’s office received a phone call from an anonymous male caller who made threats again Sul Ross State University, a nearby college campus also in Alpine. The threat was interpreted as a bomb threat, and authorities shifted their resources to the university. Sul Ross was placed on a campus-wide lockdown for hours and later evacuated, as authorities brought in bomb squads to clear buildings and even, according to Sheriff Dodson, airlifted bomb-sniffing dogs in from Austin. Another bomb threat was later lodged against the Big Bend Regional Medical Center, the Alpine hospital where the high school shooting victim was taken to. The hospital was later cleared as well. Sul Ross sophomore Jacques Wilson was in class when word came in about the shooting at Alpine High. Yvonne Herrera works at Sul Ross, and described the scene there after the university sent out an alert to shelter in place. “We all went into a separate office, we turned off the lights and they just told us to sit low, don’t have our cell phones on, and just be as quiet as we can be,” she said. Authorities eventually gave the all-clear for the Sul Ross campus, along with all Alpine schools and the local hospital. In a confounding twist to the day’s events, Dodson said a separate bomb threat was found left on the door of a room at the Marathon Motel – located in the next small town east of Alpine about 30 minutes away. No bomb was found and that scene was cleared as well. In a Facebook Post, the Marathon Motel later indicated the reported threat might have been the result of a simple misunderstanding. An investigation into the various bomb threats continues, with Dodson vowing to find and prosecute the person responsible, whom he described as “some punk” who lodged the threats “out of meanness.” Dodson said the sheriff’s office had asked the F.B.I. for assistance. Authorities do not believe the various threats were related to the shooting at the high school. Alpine I.S.D. called an emergency school board meeting in the wake of the shooting to discuss next steps and to receive briefings from law enforcement. “While the events of today are truly tragic, we all know they could have been much worse,” he wrote. As the investigation into the shooting at Alpine High continues, a number of questions remained unanswered. But late Thursday afternoon, officers were focused on finding the person who allegedly lodged the fake bomb threats, primarily because of the large amounts of money, time and coordination he cost multiple law enforcement agencies at the expense of an apparent prank. – Rachael Vasquez, Travis Lux and Pete Szilagyi contributed reporting from Alpine. This entry was posted in KRTS News and tagged alpine, Alpine High School, Brewster County, Brewster County Sheriff's Office, Crime, guns, Law Enforcement, School Shooting, Sul Ross State University. Bookmark the permalink.